My name is Javier Gil. I am an International Chess Master (I.M.) and FIDE trainer, and I work for the Sydney Academy of Chess and also as a Freelance Chess Coach. We need to test our students’ progress regularly and we’ve been using different online quiz makers for a number of years. In 2012 and 2013 we started having some problems with students who were no longer able to take the quizzes from their Apple computers, and others who wanted to use their mobile devices and tablets to take them, and were not able to because the quizzes were made in flash format. It became clear that our quiz-making software was outdated. We followed 3 products for a number of months, but iSpring QuizMaker was the main candidate in our radar, particularly because it gives users the option of producing online quizzes not only in flash (we didn’t want to give up on flash just yet), but also in HTML5 format. 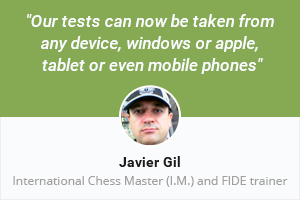 We’re very satisfied with the decision we made: our tests can now be taken from any device, windows or apple, tablet or even mobile phones. This is the kind of flexibility that modern users need. We’re also very pleased with the variety of question types, which simply makes the learning process a lot more fun for our students. 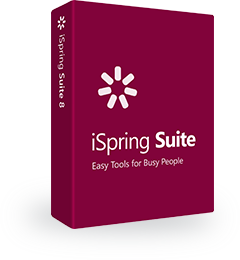 Another reason why we chose iSpring is their product support: the feedback from many users at their forum was very positive, and we also studied how long it took for iSpring staff to solve issues via their online posts at the forum or by email. We were encouraged by what iSpring users had to say. Some of the competitors do not have an active forum, others charge you for phone support. Thing like that are extremely important to us. I would recommend iSpring to any educational institution and to any business who works in the fields of training and education, but also those companies who care about their staff getting better and whatever it is they do.